Angel Hotel HotelThe Barceló Cardiff Angel Hotel is a Victorian landmark in the heart of the Welsh capital between the awe-inspiring Millennium Stadium and Cardiff Castle. Cocktails, spirits or fine wine at the Cocktail Bar before dinner. 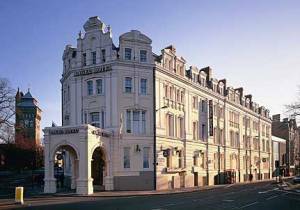 The Barceló Cardiff Angel Hotel is a Victorian landmark in the heart of the Welsh capital between the awe-inspiring Millennium Stadium and Cardiff Castle. From the North – Take M5 south and exit Jct 8 onto the M50. Continue onto the A40 and then onto the A449 to Newport. Join the M4 West at Jct 24. Exit M4 at Jct 29 onto the A48 (M) and follow signs for the city centre. The hotel is located between Cardiff Castle and the Millennium Stadium. From the South – Take the M5 North and exit at Jct 15 onto the M4. Exit M4 at Jct 29 and take the A48 (M) following signs for city centre. The hotel is located between Cardiff Castle and the Millennium Stadium. From the West – From M4 exit Jct 32 onto A470. Follow signs for Cardiff city centre. The hotel can be found between Cardiff Castle and the Millennium Stadium.